So, Toyota lent us a minivan and my husband didn’t even add magnetic flames to it. That says something. I know there are car reviewers everywhere, but I’m pretty sure few of them have (a) had their kids carve their names into their current minivan, (b) had their husbands pimp their current minivan, or (c) written a book with “minivan” in the title. Ergo, in my world of twisted logic, I’m qualified to be the next woman who writes with authority about car things. It has a spy mirror. This makes me feel like Maxwell Smart without the shoe phone. Seriously, you can drive and see which kid whacked the other on the head first, without pulling a Linda Blair head spin to see who did it. It has approximately 623 cup holders, which is two more than I need on an average road trip through three provinces. The kids can control their own AC, the side van windows actually roll down, and there are side window shades inserted IN the sliding doors. Big deal, you say? Well, we’ve had fist fights on previous trips over who gets to sit on the north side of the vehicle through Saskatchewan because it’s so much cooler. Not this time, even though it was 35 C for much of our drive to Manitoba. Dummies for sale. Note: This is not our house. My husband can haul ALL his garage sale crap/ treasures in there easily, including these baby dummies he bought in Manitoba. The Sienna has a place for my purse. Actually, it has two places, so if I’m a Glamour “Don’t” and have too many bags (like I always do), the Sienna does not mock me. It’s the exact make and model and color as my big brother’s Sienna, but it’s newer. Therefore, I win. 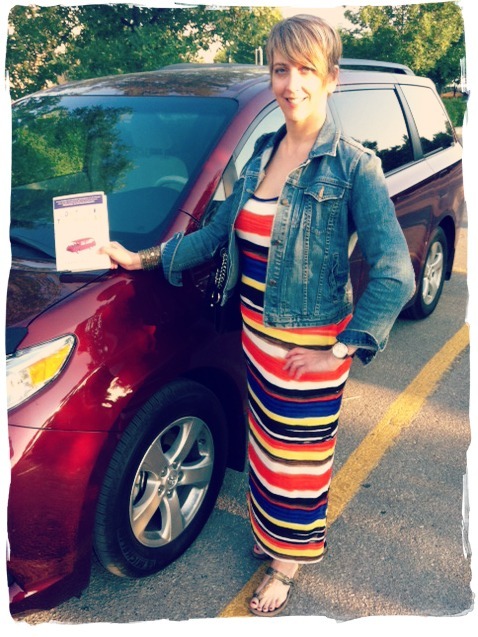 The Sienna’s sliding doors open with the push of a button on the key-fob-thingie. This is extra useful for when you’ve visited the liquor store and have your hands full of wine bottles. Also, the seat belts work wonderfully. I strapped in my bottles of wine. And yes, one of them was called Sibling Rivalry. 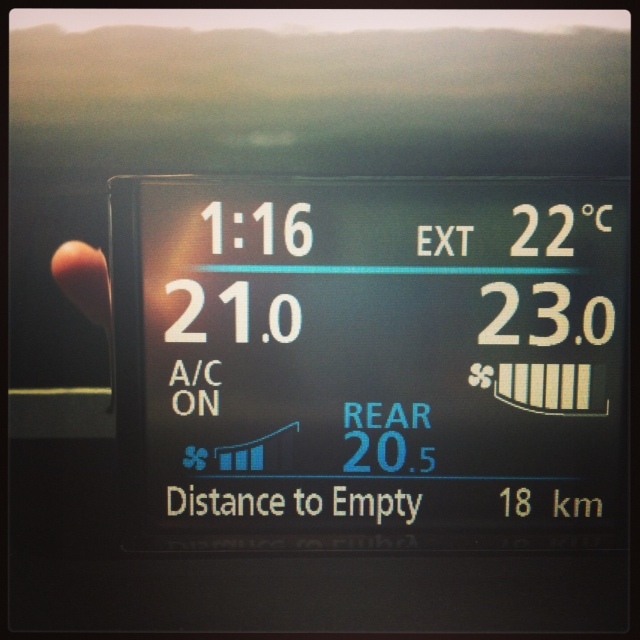 There are separate controls for the temperature for both the driver and the front passenger. Four out of five marriage counsellors recommend this. The therapist who doesn’t recommend it moonlights as a divorce lawyer. Yes, we had less than 20 kms until empty. Not. My. Fault. The Sienna’s display tells you how many kilometers you have left before you run out of gas. This can be used as evidence when you’re trying to convince your husband that you need to gas up before the next town that’s 432 kms away. A wine fridge, for the passenger of course. Safety first! 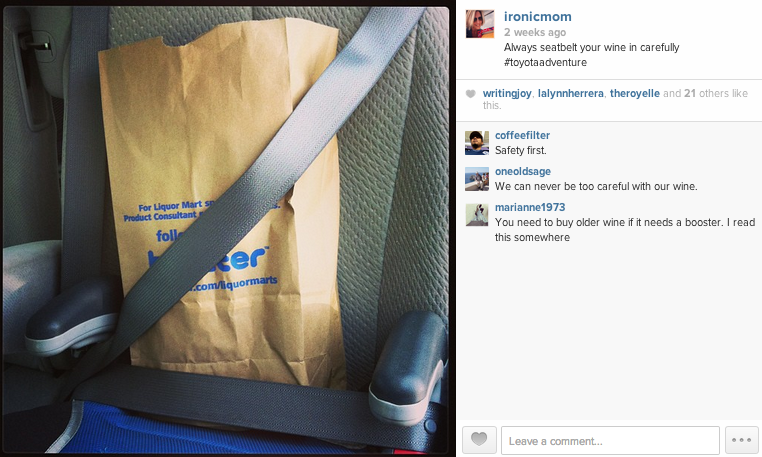 Check out more silliness in my #ToyotaAdventure tweets. What extra features do you wish your vehicle(s) had? Oh, this is too funny! My favorite line: “The therapist who doesn’t recommend it moonlights as a divorce lawyer.” From the sound of it, if your minivan had an FTL drive and a Romulan cloaking device, you could conquer the galaxy! Ha. Love the Trekkie imagery! Plus, it saves your manicure. If you have one. A tissue dispenser. I have a box of tissues which is too big for either glove box so is kicking around the floor of the passenger side, and has (of course) burst its side seams. It’s only a matter of time until the passenger footwell is carpeted with paper mâché. We don’t really do Halloween much over here. I’m sure the end-of-year school production will be needing some for masks though. Convincing! Now, where do we find that sienna with the ‘must-have’ ejection seat? I’m in “talks” with Toyota about the ejection seat. Maybe. If any of your readers steal this idea, I’ll be after them. What this world needs is the automatic parallel parking system that you start seeing more and more, but then with the extra feature that it works when you’re not actually in the car. Know those days where some cars are so badly parked (or for so long that their perfect parking has gone with their adjoining cars) that you only see spots where your car just doesn’t fit? They will be over. That is brilliant. No more idiot parking jobs! Yes! Soundproof wall behind the front seats please! Very funny, as always. Plus, it might prepare kids for taxi cab life (or life in the back of a police cruiser). It is amazing. It practically parents for you. 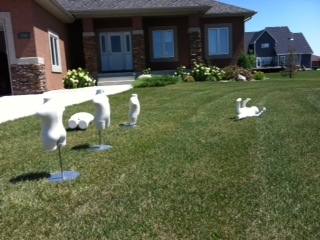 Okay, the baby dummies in the front yard are a little weird… but the rolling down side windows, awesome! My kids would love that, they are always complaining about that in our Ford van. I know. Same with our current van. It’s airless. Not this one! I used to have a Honda minivan, and your post make me miss it!!!! 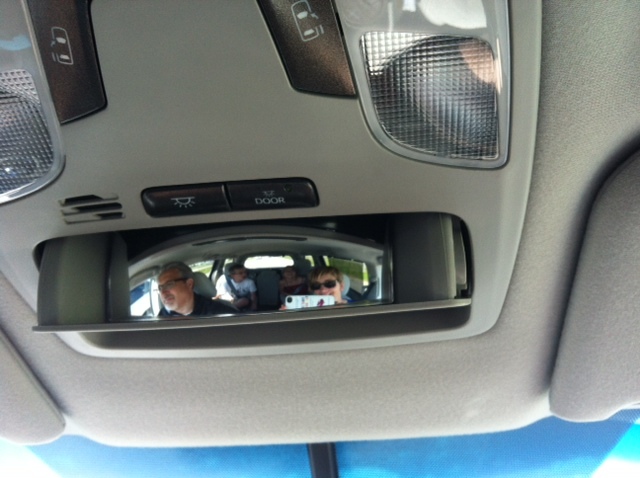 The bit about the “North side of the vehicle” reminds me of my childhood roadtrips so much….. no built-in shades in a 1982 Subaru station wagon…. mom would drape a beach towel over the side passenger window and roll it up. It’s the Ukranian doll purse. I understand. Too too well. I too have a Toyota minivan, a 2005 Sienna. I love it because it can carry two 17′ canoe’s & a kayak on the roof rack, plus 4 adult children, hubby & I plus all are luggage, oops I forgot the two dogs too all at once. We were going to my uncle’s farm for a vacation, it was a 5 hour drive and there was no fighting at all! Yes, I love my Sienna. Gotta get me those separate temperature controls. Seems like I’m always sweating and my wife is always cold. I also like the idea of air conditioned seats. There’s nothing quite as icky as giving someone a hug after a long road trip, knowing that the back of my shirt is all sweaty. I wish we had Sienna’a here in Australia, although my middle daughter is called Sienna so that could be a little weird! That left most dummy is being violated–which makes this blog entry for “appropriate audiences only”.